Region: 30 miles from downtown Kansas City, Missouri and KCI Airport. 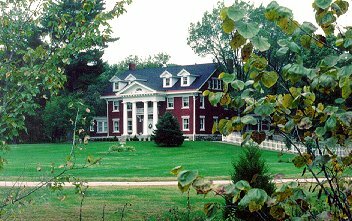 The stately three-story 1915 Georgian Colonial mansion sits on 22 acres and is surrounded by two crescent-shaped ponds. The Inn on Crescent Lake has been featured in following: KC Star, KC Business Journal, KC Homes & Gardens, KC Magazine, Midwest Living Magazine, Travel Holiday Magazine and Restore America with Bob Villa. The Bed and Breakfast was meticulously renovated in 1997. The Inn's eight luxurious sleeping rooms and suites contain a collection of antiques and refined furnishings. Each room features a large private bath, individual temperature control, cable television and elegant toiletries.